While the rest of us have to wait to see these highly-anticipated titles – highly anticipated by me, anyway – a big thanks to Conrado for sharing his early thoughts. Another report will be coming soon! -ed. The 56th Annual New York Film Festival opened on September 28 with the latest from Greek provocateur Yorgos Lanthimos. The Favourite, a period piece set in the court of Queen Anne of England, is the first movie the director didn’t also write, and thus sees him take a significant, if not definitive, step toward the mainstream. But fans of Lanthimos’ previous work should not worry. This new movie might step away from the oppressively grim worldview of his previous work, but is filled to the brim with the director’s characteristically dark humor. The plot goes as follows: Olivia Colman plays Anne, an unquestionably unqualified ruler who, had she lived in the twenty first century, would have been diagnosed with some sort of severe depression. Anne, however, rules in the first decade of the eighteenth century, and thus gets to do whatever she pleases. Rachel Weisz plays Lady Sarah Marlborough, who uses her position as the Queen’s closest “friend” to influence practically every aspect of government. Being the de facto ruler of the country serves Sarah well, since her husband is off leading English troops in a costly war against France. The final player in this story is Abigail, played by Emma Stone, a distant (and poor) cousin of Sarah’s who comes to court looking to find work as a servant. Abigail, who was born a lady before her father’s misfortunes put her in the gutter, isn’t merely looking to survive, she wants to thrive. The way you thrive in a eighteenth century court is by gaining the Queen’s favor, a task Abigail is unable to achieve without stepping into Sarah’s territory. The struggle for power between these women is a wonderful entry point to the period in European history in which the men wore more makeup than the women. Decorum and pomposity cover the decadence of this strictly monarchical system where the whole government seems to reside in the same building, as if it were the Baroque version of the Big Brother house. The similarities to reality television don’t end there. This is a system in which the extraordinary task of leading the kingdom is put in the hands of an unbalanced, wounded woman, which means the only way to change policy is to appeal to the Queen’s personal whims through flattery, romance, or blackmail. It’s a terrible set-up in which politics are reduced to petty personal drama, something that would never happen in our totally stable system of government. Lanthimos does a commendable job finding comedy in the absurdity of this world, not in small part because he loosens up his rigid style and allows for much freer, more heartfelt performances than we usually find in his work- the three lead actresses are all excellent. At the same time, this looseness leaves questions about certain visual choices. The most notorious of these is the use of extremely wide angle -occasionally fish-eye- lenses, which distort the images in humorous ways, but seem to be deployed at random and make one wonder what the movie’s larger themes are. A second viewing might be required in order to suss out those questions, which is alright given how entertaining it is to watch these women. Meanwhile, the festival’s prestigious centerpiece spot was given to Roma, which sees director Alfonso Cuarón follow up his Oscar-winning work in Gravity with a much more personal story. To say that the movie is based on Cuarón’s upbringing in 1970s Mexico City would be technically correct, but a little misleading. Unlike most directors who make movies based on their childhood, Cuarón doesn’t center the story around a little boy who stand-ins for him, but chooses instead to focus on one of the maids who worked for his middle-class family. We first see Cleo, played beautifully by Yalitza Aparicio, washing a tile floor and performing other domestic duties as family life occurs around her. The children of the house adore her, partially because her job is to take care of them, while the mother -who is going through an emotional struggle of her own- oscillates between sympathetic and cruel. At first Cleo seems to be an entry point for the movie to dig deeper into the family, but it becomes apparent rather quickly that this is her story, and that that’s the point of the movie. 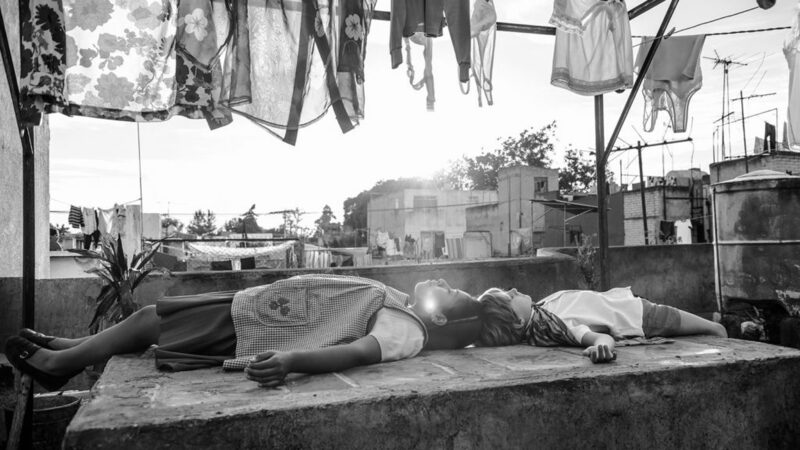 With Roma, Cuarón doesn’t just look to recreate his family memories, but his memory of Mexico as a whole. In order to do so, he’s spearheaded a production of gigantic proportions for a movie of this sort (a slow moving, black and white character drama). The screening I attended was introduced by Guillermo Del Toro, who mentioned that the movie’s production required the reconstruction of complete blocks that were destroyed during the 1985 earthquake. This sort of scope, however, is necessary for what Cuarón sets out to do. While the story is very much focused on the personal drama of just one woman, she often finds herself at the foreground of the frame and surrounded by enormous, often bizarre, tableaux meant to capture the expansive magnitude of Mexican life. These include a forest fire, a mystical martial arts lesson, and a student protest turned massacre. By positioning Cleo at the center of this epic reconstruction, Cuarón is arguing for women like her to be placed at the center of Mexican (and Latin American) history. I was born and raised in South America, and can say this movie reminded me of many women I met during my childhood. The experience of seeing a story like hers on the big screen filled me with emotion like few other movies have. Partially because of my own childhood associations, partially because of the incredible filmmaking. Roma will be released on Netflix later this year, which means that most people will probably watch it at home on their television, tablet, or even worse, cellphone. Even if Netflix has promised to release the movie in theaters, and to do so on a larger scale than they have ever done before, it will probably still be a very limited release. This is a pity because the movie is a truly outstanding theatre experience. Not only because of the incredible cinematography (by Cuarón himself), but because of the incredible use of atmospheric sound, which is as helpful as the images to recreate life in a chaotic city and is integral in the film’s oceanic climax. I don’t begrudge anyone who decides to watch this movie at home -going to the theatre can be prohibitively expensive nowadays- but I would like to urge all of you to watch Roma, whether in the theatre or at home, on the biggest screen that’s available to you.